The Canyon Cabin is nestled in the Beartooth Mountains at the base of Beartooth Pass, 'The most scenic drive in America' and only 63 miles from Yellowstone National Park, an ideal romantic spot for a couple getting away from it all. 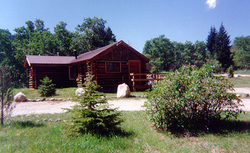 A short 4 miles from historic Red Lodge, Montana, the Canyon Cabin is accessible to a downhill ski resort, 18 hole golf course, cross-country skiing, horseback riding and hundreds of lakes, creeks and streams for fishing. Located nearby the Silver Run Elk Reserve provides excellent opportunities to view and photograph a variety of wildlife including deer, moose, coyote, fox, bear, the occasional eagle and of course elk. Red Lodge, Montana offers a myriad of activities throughout the year including winter carnival and ski joring, 4th of July Home of Champions rodeo, music festival, Festival of Nations, Iron Horse Rodeo and the Arts Guild. A night life, fine dining and many unique shops and stores are nearby. Get away to the Canyon Cabin and enjoy it all! For more information call 800-673-3563. Directions: The Canyon Cabin is located 4 miles south of Red Lodge off Hwy 212 turn left onto East Side Road and cross over Rock Creek. We are the first place on the left after you cross the bridge. Sign - Private road canyon cabin.